More Hyundai Tucson photos to go along with Michael's review. The Tucson SE has 17-inch wheels, once considered large. Strong BMW-like shoulder, rear side window. The Tucson Sport and Limited appear sportier thanks to 19-inch wheels. Wide cladding does not help. The CX-5 in the pic is a 2014. The styling has changed some with the 2016. The Tucson now shares a large, thick-barred, hexagonal grille with other recently designed Hyundais. Good proportions. The Mazda has an unusually long hood for this sort of vehicle. Sporty rake to the shoulder. Plainly styled but roomy interior. SE has small screen for infotainment. Of course, the Limited has a nicer interior. Plus a larger screen. 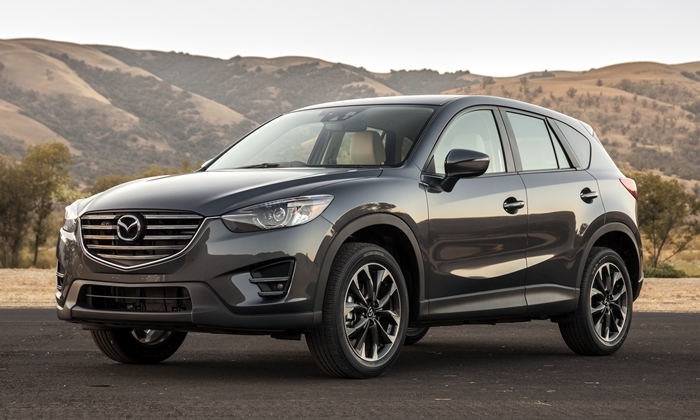 The Mazda's interior looks and feels sportier, but less solid. A largely straight across instrument panel benefits perceived roominess. Controls are mostly easy to reach and operate. Black plastic center stack looks downscale, though. Like much of the vehicle, there's nothing especially good or bad about the driver seat. Roomier rear seat than the CX-5, and than most people expect. More cargo area than before, but still less than competitors. Does this appear compact to you? The 2.0-liter engine produces nearly as much peak power as the 1.6T, but not nearly as much torue.